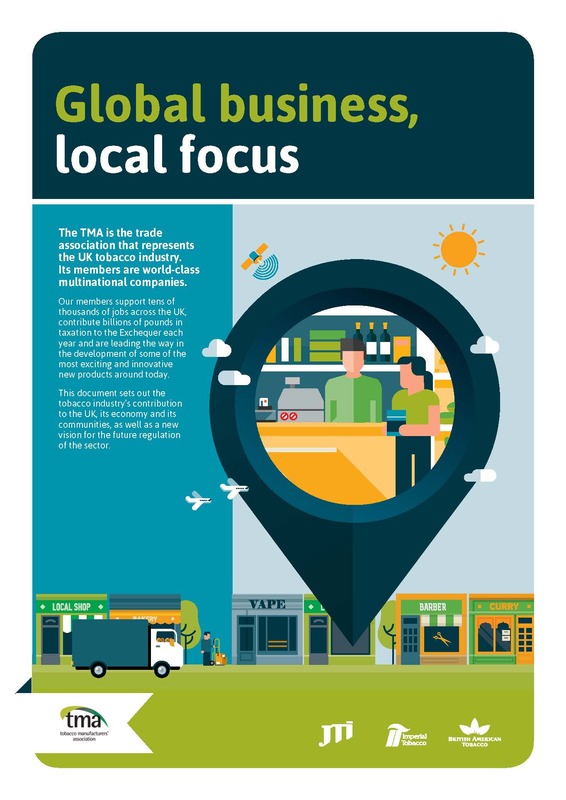 The TMA is the trade association that represents the UK tobacco industry. At the TMA, we work closely with member companies in order to represent them to national, regional and local government as well as the media and other stakeholders. The TMA’s members are world-class multinational companies. They support tens of thousands of jobs across the UK, contribute billions of pounds in taxation to the Exchequer each year and are leading the way in the development of some of the innovative consumer products around today. Many, perhaps most, people don’t know the scale of the tobacco industry’s contribution to the UK economy and local communities up and down the country. Tobacco manufacturers pay in the region £12 billion every year in tax, which represents around £400 per tapayer. Since 2000, the tobacco industry has paid more than £170 billion in tax to the UK Government. That’s enough to pay for 55 new aircraft carriers, more than 5,600 new schools or the Scottish Government’s total budget for 5 years. Ten million adults across the UK enjoy a variety of tobacco and other nicotine products, such as e-cigarettes. Tobacco products have well-publicised health risks and we fundamentally believe that only informed adults can make the choice to smoke or use other related products. That’s why tobacco manufacturers work with social enterprises, such as CitizenCard and the Responsible Tobacco Retailing Programme, to tackle youth access to tobacco and drive up standards in the retail industry. It’s also one of the main reasons why the TMA’s members provide resources, intelligence and state-of-the-art equipment to HM Revenue & Customs, Trading Standards Officers and local councils in order to detect and remove illegal tobacco products, which reduce retailers’ revenues, costs the Exchequer more than £2 billion in lost tax revenue every year and are often sold to those who are under age. In short, the tobacco industry plays its part and, as a responsible industry, we are more than happy to contribute in areas where we are best placed to add value.